Painful knees are a very common occurrence among the elderly and so was with Mr Narayanaswamy. He continued to live with painful knees which eventually hampered his everyday activity. There was chronic pain and despite medication his walking and general movement began to decline. He continued to console himself that the reduced activity and stamina was owing to his increasing age. But after a prolonged period of about two years, by when he was bed-ridden and almost totally inactive – he underwent total knee replacement as advised by his doctor. After an initial rehab of knee replacement, an average person usually reports significant improvement in walking and other movements. Unfortunately Mr Narayanaswamy was not showing any signs of recovery. Instead he consistently suffered from fever and weight loss. Eventually a TB infection was diagnosed that had affected the TKR implant too. So a revision surgery had to be performed on him shortly, thereafter. I was to be his home visit Physiotherapist from ReLiva. On his initial assessment, I realized that it was not just his stamina, he was even having difficulty balancing himself while standing. He had been bed-ridden and completely inactive for more than a year. As a physiotherapist, I identified that his immediate goal was to improve his balance, regain strength and thereafter build up his stamina. All of these eventually will help him regain self-confidence. Together we worked hard day-in and day-out. I would visit him regularly at his place and work on his goals through a combination of therapy and exercises. Gradually he showed signs of recovery and began to stand properly on his own. We systematically progressed to the next set of exercises. Now I had prescribed him several movements to be done on his own during the rest of the day. The committed and sincere person that he was, he would do those home exercises diligently on most occasions. We were moving from one strength to another. It was at the end of another session of physiotherapy when he broke the news with a beaming smile that he was thinking of visiting his daughter abroad! We had come a long way. Here was a man who was completely bed-ridden for a year and a half and could not even speak on the telephone for more than a minute and NOW – he wanted to travel overseas! He was daring to dream and together we shall have to make his dream come true! We now worked towards a deadline when he could walk independently to take this long journey on his own. Last, I saw him the day before he was to take his flight and he walked on his own with his walking stick. We did some strengthening exercises which he would continue doing on his own while he was away. He told me that “I am a happy individual now. I am back to life!” … what he didn’t realise was : What a happy and delighted therapist he was leaving behind in me watching his dream come true! As shared by Dr Shrutika Parab (PT). 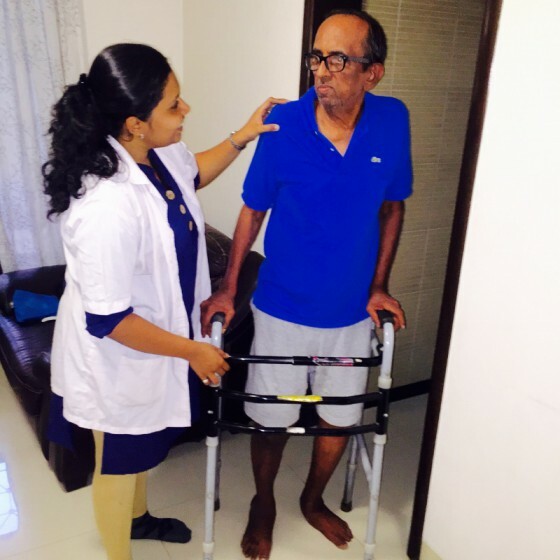 Dr Shrutika is a home visit physiotherapist with ReLiva Physiotherapy. She is popular among her clients for her enthusiastic and positive approach.